We have been on the road! Beautiful sunsets in Menemsha on Martha’s Vineyard! Fun in the sun in Florida! 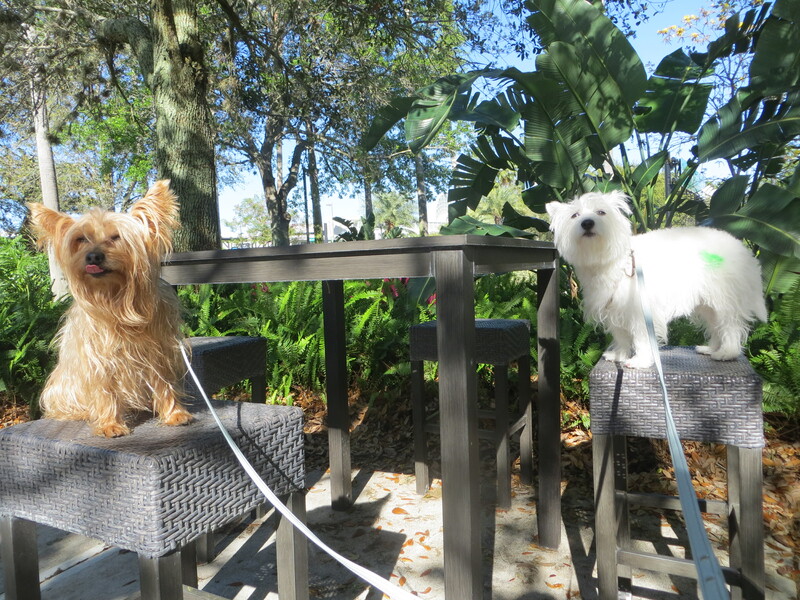 When we were asked to model at this year’s Global Pet Expo in Orlando, Florida we were so excited! Global is the pet industry’s largest annual trade show with 1,000 exhibitors, 4 miles of show floor to walk, and thousands of new products. The American Pet Products Association estimates that overall spending in the pet industry for 2014 could reach over $58 billion!! That sure is a lot of kibble! Although we’re not professional trend spotters, we did notice several trends that we think will continue to grow. And most of our favorite companies from SuperZoo last summer exhibited at the show, too! 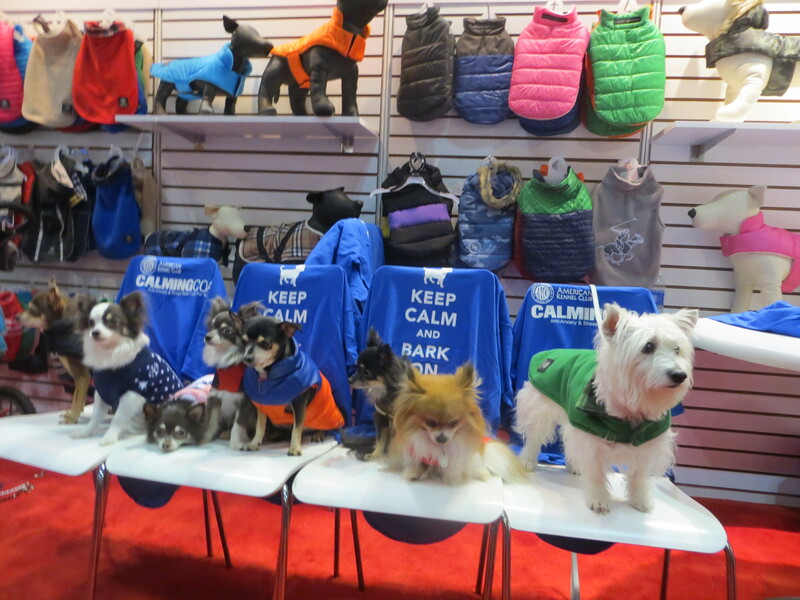 Here’s what we noticed at Global Pet Expo! Adoptable pups, companies that give back, and toys with a mission were all superstars at Global! Adoptable pups were front and center at Global with Florida Little Dog Rescue showing dozens of cuties at the event. 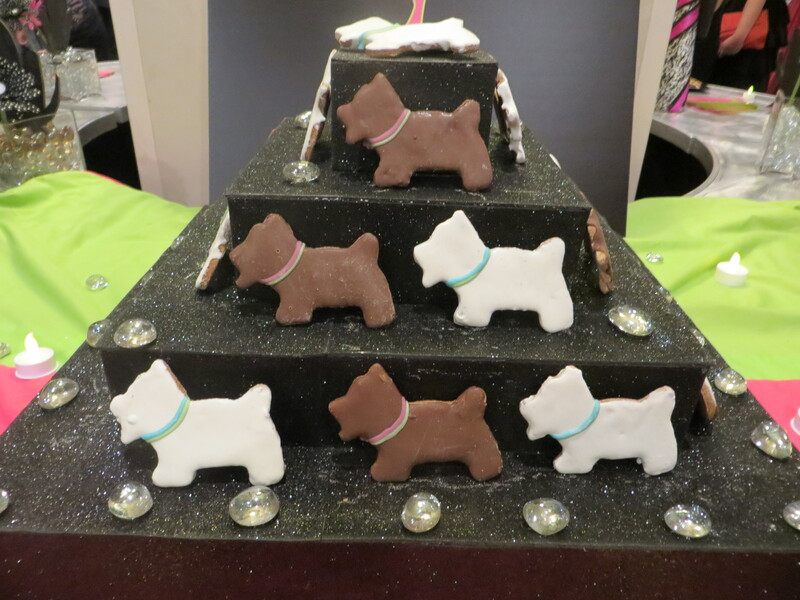 DOGSFOOD DOG for DOG took home Best in Show in the dog category in the new product showcase. For every product they sell, they donate to a dog in need. Furry & Fabulous toys donate proceeds to help autism and Alzheimer’s. Wow! Some very cool pet products in this category! We love iCPooch! It is a video chat system where you can have a 2-way video chat with your pup and deliver dog treat! It retails for $149.99 and is Made in the USA. PetChatz is another “greet and treat” machine that allows you to remotely interact with your pup using a smartphone.The iQ StarWalk attaches to a collar and helps track exercise. It also has a nightlight and syncs with smart phones to track data. Voyce is another wearable technology for dogs. It monitors dog vital signs to help get a complete picture of how your pup is doing. PetAcoustics Pet Tunes was one of the coolest products at the show — a preloaded device with soothing pet music. We have been attending trade shows for years and have never seen so many products to help keep pups safe while riding in the car. (We think that is great!) We follow the Center for Pet Safety’s reports to see what they recommend. PupSaver, a small dog car safety seat, conducted their own testing and is a great option for dogs under 25 lbs. One caveat — please add a removable cover so we can wash it! 4pets, a Swiss company, had some unique car safety products including a mounted “penthouse system” for small dogs. We knew once gluten-free foods hit mainstream human foods, the trend would spill over to pet food. Mom still has to sort through all of our food samples and brochures. Our advice — read the label and buy American! Don’t fall for gimmicks . . .
How many beds does a pup need? Just when we thought we had enough beds, (I think we have 8 in various forms and sizes!) we saw new and different must-have beds at Global. From Alcott doggy sleeping bags, to scented futons, to leather loungers, to Molly Mutt duvets stuffed with mom’s laundry — what will designers think of next to help us get some rest. Don’t they know we sleep in mom’s bed – BOL! Big-name mattress brands like Sealy have doggy beds, too! We modeled the new BH Pet Gear CalmCoat and we think it works! The soft coat gives us a hug and makes us feel safe. ZenPet has several calming products including a spray made from essential oils. We love the idea of Earth’s Balance Pill Paste to hide the bitter taste of pills! The Green Pet Shop had cool pet pads that we must get for this summer! 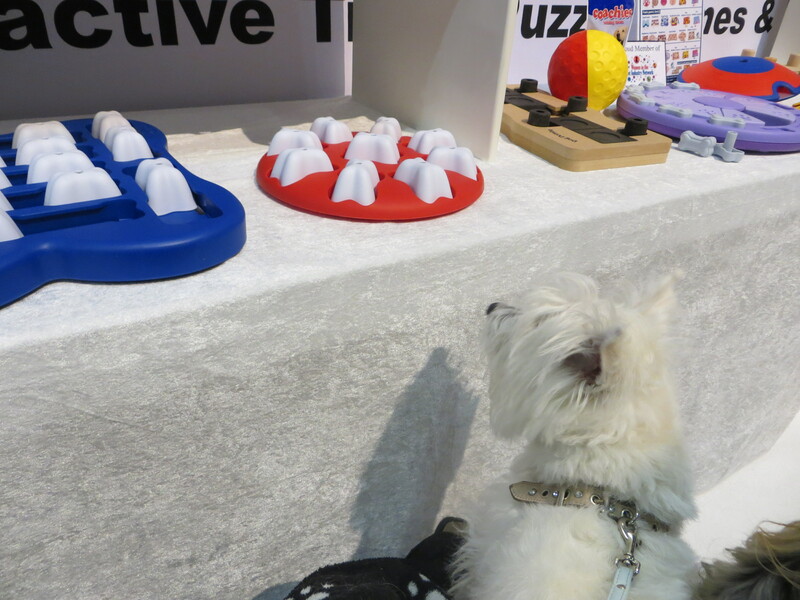 We loved all of the interactive toys and games – our favorite trend!